Chances are, you value your brain more than just about any other part of you. It has gotten you this far, and you’ve come to rely on it a bit. Right? Maybe you have always assumed that it will be at your service, functioning as it always has, remembering things, staying alert, keeping track of your keys and your appointments, and nearly effortlessly recalling names, dates, and words, whenever you need them. And maybe it has only rarely hurt beyond the occasional tension headache. It’s there for you. You probably take it for granted. So, what the heck is going on now? Remember back in the day when “I have a headache” seemed like a perfect excuse to get out of intimacy when you were just too tired? Those occasional “headaches” may have been figments of your brain’s imagination, but maybe now you are getting payback because…your head hurts! Headaches, and often migraine headaches, are a common symptom of the period surrounding menopause. It’s part of the hormone dance. Migraines in particular have been linked to hormonal fluctuations, so if you have them now in a way you never did before, don’t panic. You probably don’t have a brain tumor. It’s probably just your changing hormones. That’s not to say that a persistent new headache, blinding in nature, should not be investigated. It should be. Talk to your doctor. But the chances that it is menopause-related are pretty high, and there are treatments out there that can work. Signs that you are dealing with a migraine include intolerance to light, nausea or vomiting, and sometimes an “aura,” which often involves visual changes that precede the pain—such as seeing lights, or wavy lines or other disturbances. There could also be issues with speech, or numbness and tingling. When these symptoms are severe, definitely see your doctor, as these aura symptoms have been correlated with stroke later in life. But more often than not, menstrual migraines are just a pain in the brain, and something that may need treatment now, but which will come to an end when menopause does. 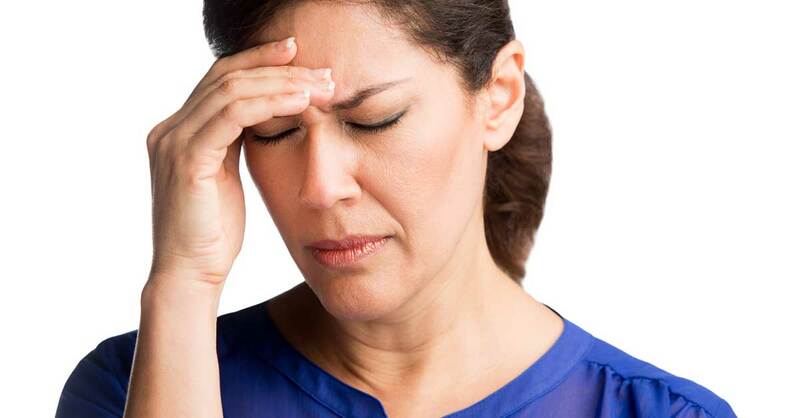 Tension headaches can also become more frequent with menopause. These are easier to deal with, and are often a side effect of stress, both emotional and hormonal. You may find you can deal with them by taking a nap, a bath, doing some exercise or yoga, engaging in a good hearty crying session, or just popping a couple of naproxen, ibuprofen, aspirin, or whatever you find wedged into the corners at the bottom of your pocketbook. Maybe you’re one of the lucky ones who doesn’t get menopause headaches. Lucky! But maybe you have other brain symptoms, and believe me, you would not be the only one. You know that thing that happens when your brain stops doing what it used to do? It’s the other major brain issue. You know which one. What’s it called? What’s the word? Wait, wait, it will come to me! It’s menopause brain! Don’t drink too much alcohol—but do drink plenty of water to stay hydrated. Stay moving and exercise as much as possible. Don’t get lazy with your brain activity. Keep yourself engaged and stimulated, memorizing, creating, and speaking. Consider relearning that foreign language that was mandatory in high school. Travel. Talk to new people. Disrupt your routine. All of these things can keep that brain machine of yours as well-oiled as possible. Your brain does not exist in a vacuum. Everything that is happening to you right now because of hormonal fluctuations—sleep disruption, hot flashes, fatigue, stress, depression, anxiety, weight gain, bloating, and just not feeling like yourself—has an impact on your brain function. It can feel like a cruel joke, but it happens to just about everyone. And it is temporary. So, do what you need to do to keep yourself healthy. Breathe. Make healthy choices. Talk to friends, a therapist, the women next door in her 70’s who can remember when it happened to her, or a psychiatrist, if you need one. Keep some ibuprofen in your bag. Set reminders on your phone. Put sticky notes everywhere, if that helps. I promise you will be feeling better soon. And, definitely do not count the minutes. It will give you a headache!